Wormadam Trash in game: 1,015 Who? Important notice! Pokemon Wormadam Trash is a fictional character of humans. Wormadam (Japanese: ????? Minomadam) is a Bug-type Pokémon introduced in Generation IV. It evolves from female Burmy starting at level 20. It is one of Burmy's final forms, the other being Mothim. 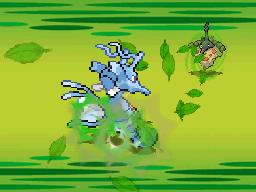 It has three different secondary types: Steel, Grass, and Ground, determined by its cloak. Its cloak is permanent and determined by the cloak that Burmy was in when it last battled. 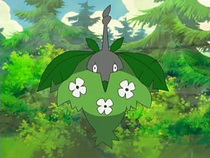 In its Plant Cloak, it is Bug/Grass-type. In its Sandy Cloak, it is Bug/Ground-type. In its Trash Cloak, it is Bug/Steel-type. 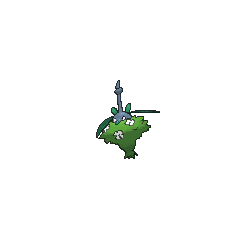 Wormadam is a black, bagworm-like Pokémon with a coat of leaves, sand, or building insulation that has fused with its body. It has oval eyes, a long pointed beak, and a long antenna with a coiled tip. The beak is tipped with varying colors depending on the coat. 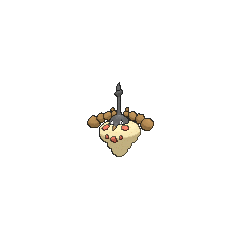 The coat forms a pair of arm-like structures near this Pokémon’s head. 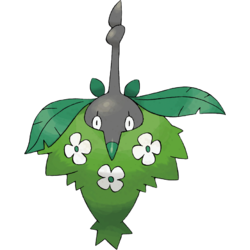 The Plant Cloak form has several white flowers covering it, and gives Wormadam a green-tipped beak and large leaves for arms. It will be dotted with reddish-brown rocks, and have chains of pebbles for arms and a brown tipped beak if it has the Sandy Cloak. 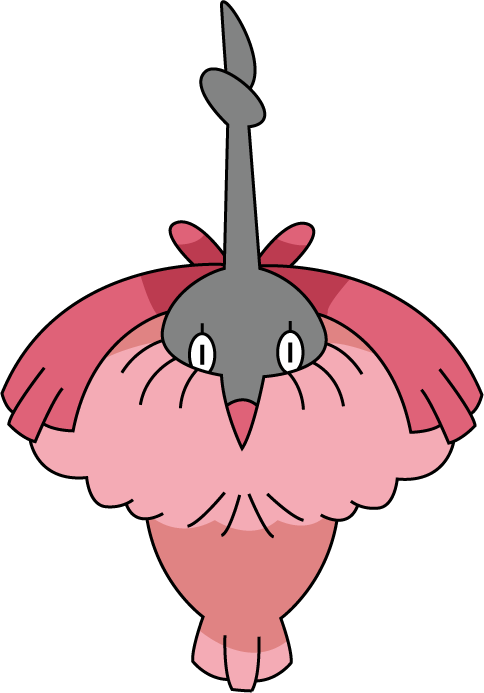 When covered by the Trash Cloak, it has a pink tipped beak and long, dark pink ribbons for arms. Wormadam that evolve on cold days are said to form thicker cloaks. It is a female-only species, with Mothim as its male counterpart. Cheryl has three Wormadam, each representing one of the forms. They appeared in Some Enchanted Sweetening!. A Sandy Cloak Wormadam belonging to Ursula appeared in Another One Gabites the Dust!, where it was used in the Performance Stage of the Chocovine Contest, allowing Ursula to move on to the Contest Battles. 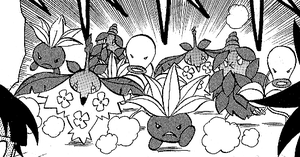 A group of Plant Cloak Wormadam also appeared in The Rise of Darkrai. A Plant Cloak Wormadam appeared in Kalos, Where Dreams and Adventures Begin!. A Plant Cloak Wormadam made a brief appearance in Bonnie for the Defense!. DP030 Wormadam Ash's Pokédex Wormadam, the Bagworm Pokémon, and the evolved form of a female Burmy. Its appearance changes depending on where it evolved. Wormadam was first seen in a Sandy Cloak under the ownership of one of the members of the Celestic Town brigade that Cynthia assembled, during the Diamond & Pearl chapter. 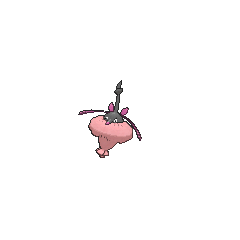 A Trash Cloak Wormadam was used by a Youngster that Platinum watched at the Battle Factory. 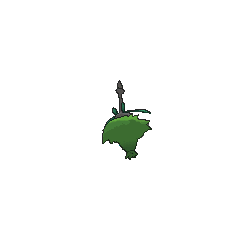 A Plant Cloak Wormadam was seen in the wild in Fullmoon Island. Several Plant Cloak Wormadam were seen around Meragura Volcano. It is said that a Wormadam that evolves on a cold day will have a thicker cloak. Moves marked with a superscript game abbreviation can only be bred onto Wormadam in that game. 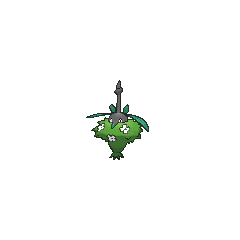 For other sprites and images, please see Wormadam images on the Bulbagarden Archives. Wormadam is the only Pokémon with forms of different types that cannot switch between its forms. Wormadam and its pre-evolution share their category with Pineco and Forretress. They are all known as the Bagworm Pokémon. Wormadam and Mothim are the only Pokémon with a base stat total of 424. In Pokémon Black and White, School Kid Ann on Route 12 has a Sandy Cloak Wormadam that knows Leaf Storm, a move that Sandy Cloak Wormadam cannot learn by any means; it is instead learned by Plant Cloak Wormadam. Prior to Generation VI, Wormadam's body style was . Wormadam is based on an adult female bagworm, which never develops wings. Wormadam is a combination of bagworm and madam (indicating its exclusively female nature). Minomadam is a combination of ?? minomushi (bagworm) and madam. Mandarin Chinese ???? Jié Cao Guì Fù Combination of ??? Jié?caochóng and ??. Literally "Weaved grass madam".